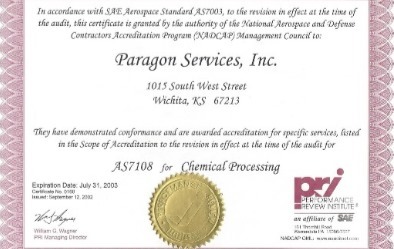 History | Paragon Services, Inc.
Larry Elliott and Dale Graham founded Paragon NDT & Finishes, Inc.. 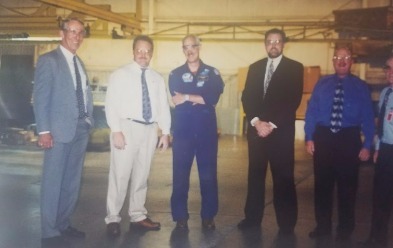 These quiet, unassuming technicians built the business on the basis of "Superior Quality or Nothing". Paragon earns the reputation of "doing things others either couldn't or wouldn't do". 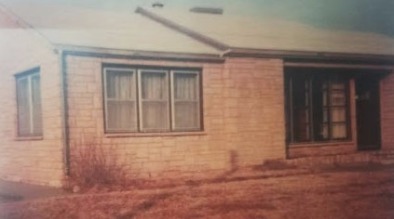 It all started in a small stone house on West Street, 'without even a paper clip'. Perseverance, skilled personnel and the knowledge that there was a definite need were their main assets in 1979 and remains so today. Our 24,000 square foot plant was built equipped with the latest inspection and processing equipment and procedures. The newly built facility was compared to something out of a James Bond movie containing an overhead monorail system allowing for ease in moving parts through the various processes and other technologies ahead of the times. Larry Elliott was known by many for his inventive mind and the original building exemplified this. 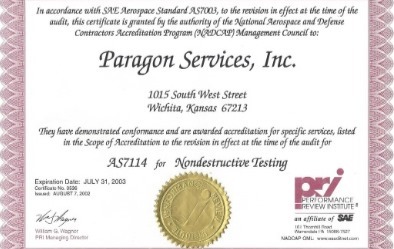 Learjet's engineering department was receiving inconsistent inspection results from operators throughout the world making the data useless, so they reached out to Paragon for help. Learjet contracted Larry Elliott and Paragon to author the Learjet Non-Destructive Inspection Manual. The manual provided very specific and detailed inspection instructions to achieve consistency for NDI facilities around the world. This manual, along with training seminars conducted in countries around the world, provided the information necessary for engineering to gain confidence in the inspection process of Learjets worldwide. "People know that largely, air travel is safe, but they don't know why. We are a part of that process. ", said Larry Elliott. Owner, Larry Elliott Changes NDT Testing Practices with the Larascope, an Optical Prism. 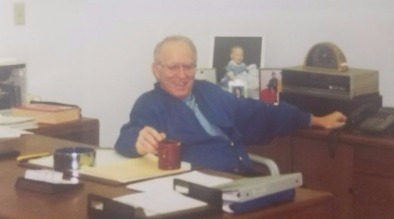 Larry Elliott re-purposed an old optical prism and, with some slight engineering, he pioneered a way to inspect around the fasteners of acrylic windshields and side windows of aircraft. Prior to his invention, X-Ray, and Ultrasonic were used but was extremely troublesome, time-consuming and costly to adequately inspect those areas. 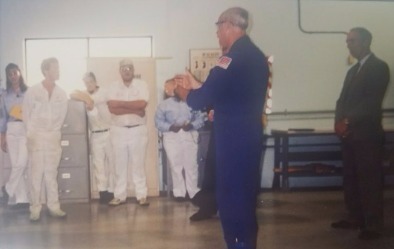 Pictured to the right is the first order of Larascopes shipped on September 14, 1984, to Gates Learjet Co. 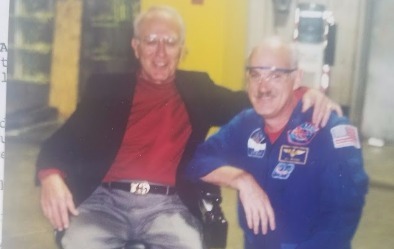 The Larascope is still widely used in the industry today and is even referenced in the Learjet NDT Manuals as a "Larascope" donned by its creator Larry Elliott. Larry built and sold Larascopes for over 10 years. The Paragon mobile lab was designed to facilitate the on-site needs of several technicians and contained all of the equipment necessary for on-site inspections, including x-ray machines and a dark room with a high volume automated film processor. The lab allowed the Paragon technicians to travel to our clients across the nation and stay "however long it takes to get the job done." The ability to show up at a customer's facility, perform the inspections and provide results prior to departure streamlined the process and gave customers the best possible inspection and turn times, unmatched to this date. Paragon's biggest mobile lab supported 4 Technicians. This is the original Mobile NDT Lab built by Larry Elliott in his garage with the help of his son Brock and family. Paragon's Mobile lab named "Constellation". 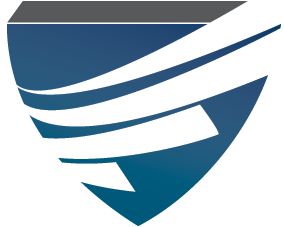 When the threat is deep, companies know they can trust Paragon Services, Inc. to deliver. 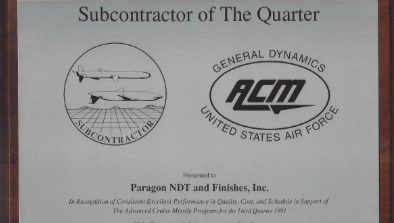 Paragon received an award 'In Recognition of Consistent Excellent Performance in Quality, Cost and Schedule in Support of The Advanced Cruise Missile Program' in 1991. When a security contractor needed a cleaning and testing process developed for the Advanced Cruise Missile - they relied on Paragon. 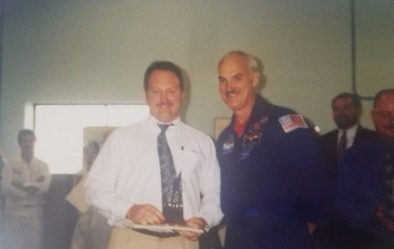 Due to the work that Paragon performed for the Martin Marietta Space Shuttle Program, Astronaut William Francis Readdy, came and took a tour of our plant and presented Paragon with an award. 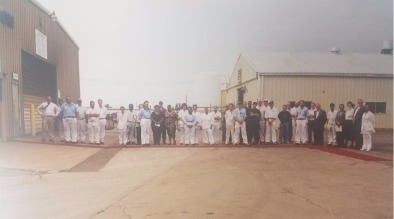 Paragon employees got to enjoy meeting those who directly benefited from a job well done within our plant. 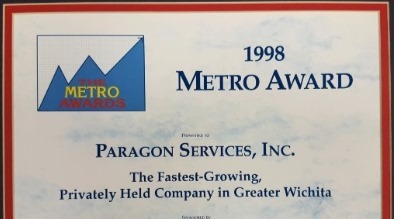 The city of Wichita, Kansas recognizes Paragon's hard work and dedication. To meet the demands of an ever-changing market, Paragon decided in 2012 to expand it's chemical conversion coating capabilities to include Alodine 600. 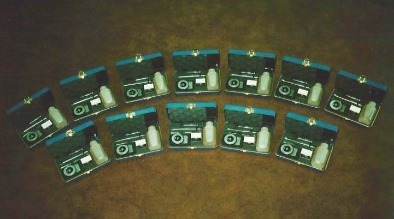 This provided Paragon with two types of chem-film coatings in addition to it's anodize coating. 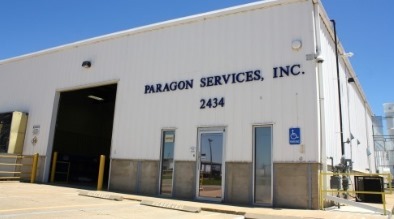 Paragon was excited to expand into a new facility and provide an opportunity for its customers to obtain a quicker turn around time and increased volume capabilities. Paragon began its first month of work in the new facility in February of 2016.